The question we most often ask ourselves of an illusionist or magician is how did he do that? The truth is that it doesn’t really matter because the wondering is the best part. David Copperfield has spent his entire career making people wonder. This is why his Las Vegas production, David Copperfield: An Intimate Evening of Grand Illusion is one of the most popular shows in town. I recently checked it out at the David Copperfield Theater at the MGM Grand. 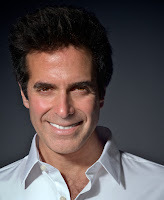 To get to know David Copperfield it helps to time travel back to each decade of his career. Growing up in the 60’s, David had what he says in his own words, a shy and lonely childhood. One summer he discovered that learning magic tricks and ventriloquism helped him overcome his shyness. After mastering several magic tricks he started his career at ten years of age back in New Jersey, as “Davino Boy Magician,” performing around the neighborhood. It wasn't much later that he started to indulge his passion for entertainment and showmanship by taking the train to NYC and sneaking into Broadway shows after school. A few years after returning to New York he was given a shot at his own TV special on CBS. The Magic of David Copperfield aired for the first time in 1978. He was only 22 but so skilled at magic and camera friendly that his specials continued for over two decades, accumulating 17 Emmy Awards! I went online to find some of these specials and ended up watching for several hours. Beyond the magic I was interested in what these 23 years of TV specials reflected...changes in the tricks and illusions, the music, his wardrobe, hairstyle, and David himself. The illusions in The Magic of David Copperfield ranged from sleight of hand to massive stunts in size and scale. There was the dancing cane, sophisticated card tricks, impaling himself while levitating, and highly entertaining dramatic or comedic acting scenes with magic weaved in using celebrity guest stars. In addition, his big show finishes were what made him a name, like a disappearing airplane, walking through the great wall of China, and a Houdini like escape act using a straight jacket over fiery spikes! Copperfield's look and persona in the earlier specials were first the young, wide eyed magician, then the slightly tanned illusionist with his first real Hollywood haircut, followed by the magic master, and finally the superstar illusionist extraordinaire. Come 2001 and the new millenium he transitioned to shorter hair again and for the most part has kept this look ever since. His wardrobe tells a story as well. The late 1970’s Copperfield dons a tuxedo, then the next year a suit, even a white three piece disco getup in a scene with Bernadette Peters. The 80’s started with black shirts and skinny ties, then a puffy white shirt and even puffier leather jacket, the next year leather pants were added. The early 90’s were long dark coats, moving into black jeans and belts and a velvet blazer, mock turtlenecks and shiny silver belt buckles. He wore them all well. The best of these specials are combined in a DVD, David Copperfield, Illusion. 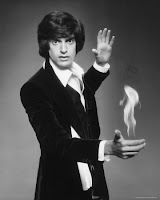 During the television special years, Copperfield pursued other interests beyond performing. He founded “Project Magic," a program that uses the teaching of minor magic skills to those recovering from disabilities, augmenting their rehabilitation with creativity. A collector of magic memorabilia, he created the private International Museum and Library of the Conjuring Arts which the Guinness Book of World Records has called the largest collection of magic artifacts on earth. It’s only fitting that David Copperfield’s next chapter after over two decades of TV specials and live appearances would lead him to Las Vegas, a town known for illusion (and not just on stage). At the beginning of the new millennium it was time to find out if he could sustain a Las Vegas show, night after night, year after year...Not surprisingly, he has. Doing two shows a night, he performs for several weeks at a time and then takes a little time off, sometimes traveling to his home now known as Musha Cay: The Islands of Copperfield Bay, which he also operates as an ultra luxury resort. If you're wondering what his current show, David Copperfield, An Intimate Evening of Grand Illusion is like...I can tell you it's just that. From his first entrance I found him to be more candid and open with the audience than I had expected. He shares a few personal stories, and also some fantasies entwined into his illusions that focus on the importance of family, and of pursuing ones dreams. The audience is a part of this, sometimes onstage and sometimes right at their seat. An Intimate Evening of Grand Illusions balances a large scale look with an interactive feel, and includes a stunning variety of surprises. What does the next decade hold for David Copperfield? His genius for magic and illusions with a combination of artistry and showmanship leaves no doubt that whatever it is will be spectacular.